Minted in 2005, the Westward Journey Nickel, brought the Bison back to the obverse design of a U.S. coin after a 67 year hiatus. The nickel honors the American Bison after being hunted nearly to extinction. It is composed 75% copper and 25% nickel and is nestled in the embellished wood grain handle of this classic pocket knife. 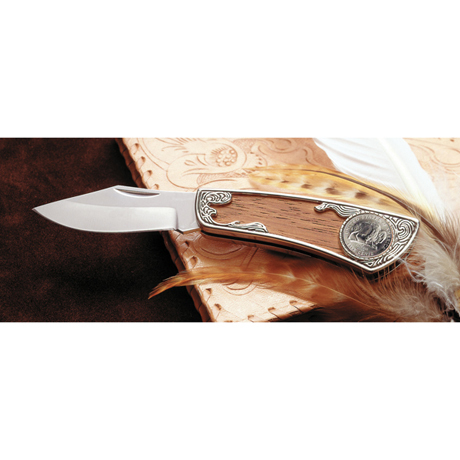 An exclusive design of American Coin Treasures, this extraordinary pocket knife features a 2 7/8 inch stainless steel blade and includes a Certificate of Authenticity. Allow 1-2 weeks for delivery. Item can only be shipped within the Continental US.